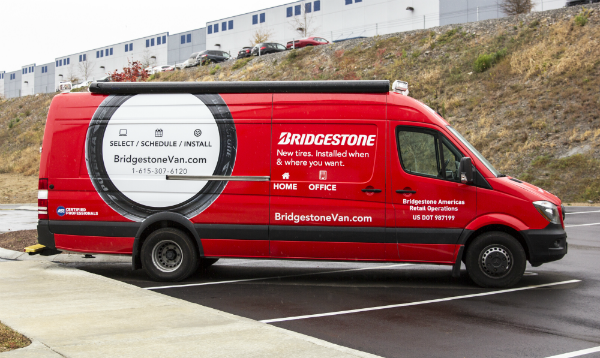 Bridgestone Mobile Tire brings new tires to you and installs and balances them on the spot at your home or office. No hassle. No waiting room. No extra charge. Call us to get a quote or fill out the form below and one of our friendly experts will help you find the right tires for your vehicle. Tell us what works for your schedule and we'll get it on the books. Choose a location - home or office in the greater Nashville area - and we will come install and balance your tires on the spot. Designed to be the best, the mobile unit is equipped with premium replacement technology for quality service you can trust. Our friendly, skilled experts are ASE Certified and can complete a standard installation of four new tires in about an hour. Whether you're on the sofa or at your desk, you'll barely know we're there. Our courteous tire experts use quality tools so you get new tires with no headache. Service limited to the Greater Nashville Area.